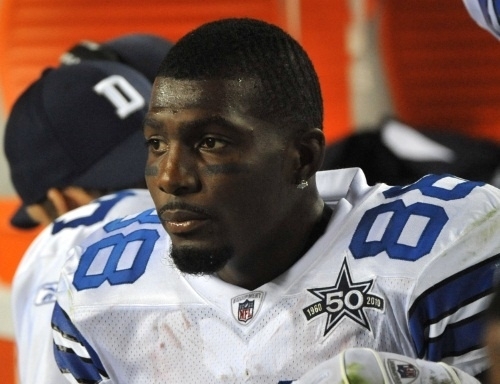 Dallas Cowboys rookie wide receiver Dez Bryant has been named in two lawsuits claiming he owes more than a half-million dollars for custom jewelry and pro football and basketball tickets. According to papers filed Friday in Dallas County, a New York jeweler claims that Bryant has not paid $240,000 for several pieces of jewelry he ordered on four invoices from January to May 2010. He was drafted by the Cowboys in the first round on April 22. Our short, regional nightmare is over: Dez Bryant is welcome once again at North Park Center Mall in Dallas. Either way, it’s a relief to know Dez Bryant will be able to shop in peace again. His adviser says Bryant and the mall have both apologized for their actions which led to Bryant being given a criminal trespass citation. David Wells, the adviser for Cowboys wide receiver Dez Bryant, met with officials from NorthPark Center mall for two hours on Wednesday to dispute a criminal trespass warning issued to Bryant from off-duty police officers Saturday. The dispute started when someone in Bryant’s party was wearing sagging pants that showed underwear. Mall security accused Bryant of wearing sagging pants, something he denied. Wells said Bryant did not go to the mall Wednesday, as he promised he would on Twitter, but is hopeful the issue can be resolved. Mall officials have declined comment, but Wells said he’s received phone calls from various merchants at the mall offering encouragement. Bryant has had numerous problems at the mall, according to the police report from the most recent incident, including parking his car in a fire lane, cutting in line at the Apple store (according to Wells, Bryant offered to buy something for the patron he stepped in front of) and a “major disturbance” with an unknown woman at a restaurant. Police were called in the last situation, but both Bryant and the woman were gone before they arrived. Big Racks BBQ & Sports Grill is the ultimate destination for Award Winning Texas BBQ! Located centrally in Grapevine, we are your unrivaled BBQ and Sports Bar destination. Whether you are looking for a perfect lunch location, a dinner experience with the family, or you just want to cut loose with some of the friendliest waitresses in town and catch a game, Big Racks BBQ & Sports Grill has you covered! Join us with friends and family! Cheer on your favorite sports teams on one of our wall-to-wall High Definition LCDs! We have 96 inch and 120 inch HDTVs, so just like our food, size is never an issue! Oh yeah, unlike other so-called sports bars, there is never a bad seat in our house, we guarantee that! We aren’t just BBQ, we’re a BBQ experience. A body found underneath a barbecue pit built by a Novato, California woman at least six months ago is that of her husband, authorities said Thursday. Dale Smith, 74, was found buried at least 4 feet underneath the patio of the home he shared with his wife, Evelyn Smith, 55, investigators said. The cause of his death has not been determined pending toxicology tests by the Marin County coroner, said police Lt. John McCarthy. Evelyn Smith is a “person of interest” in the case, which could be anything from a homicide to improper disposal of human remains, McCarthy said. The body was discovered Feb. 23 by an FBI evidence response team that had been given permission to dig by Evelyn Smith’s attorneys. Neighbors had not seen Dale Smith since at least September. It was around that time that his wife and two laborers put in a brick barbecue pit in the backyard of the home on Rebecca Way, neighbors said. Evelyn Smith never reported her husband missing. A neighbor finally called police last month. An attorney for Evelyn Smith, Hugh Levine, said Dale Smith was ill and that it was possible he died of natural causes. Dale Smith was a Korean War veteran and retired contractor. His wife used to work for the U.S. Postal Service. The couple were married 18 years and did not have any children together.